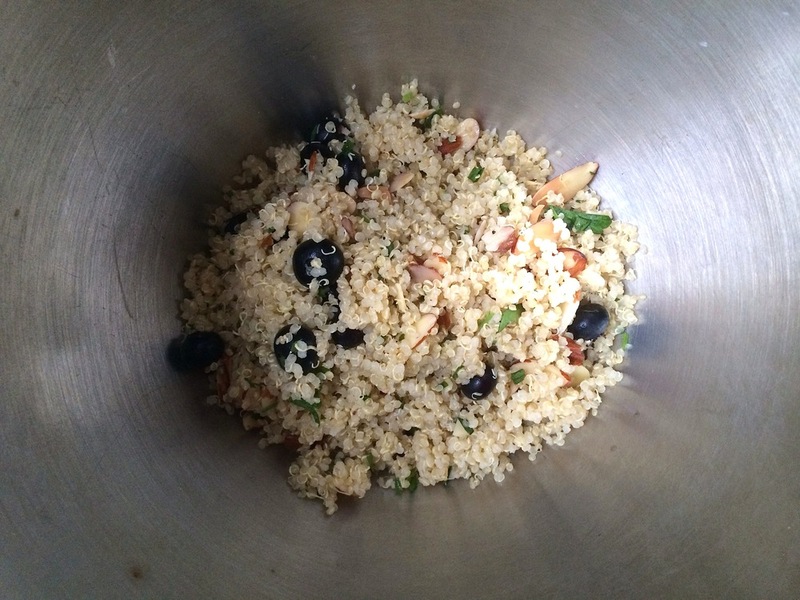 What to do when you have left over blueberry and quinoa salad? I mentioned said salad in the past post. And for me, the answer to this question, was: bake it somehow. This salad had a light dressing, and vinegar is a raising agent anyway, so why not. I went for a glutenfree quickbread. It was a relatively simple affair. I measured two cups of the salad and put it aside. Whisked some eggs (farmers market, from pasture raised chickens), raising agents, and my usual gluten-free flour mix. I folded in the quinoa salad, and finally added some almond milk. I put the batter in a bread pan, lined with parchment paper, and then let the bread bake until golden brown (about 45-50’) at 375F. Result? Well, first, this bread, like all bread was delicious when warm – good start for a quickbread :). Then, it had a beautiful chewy, wholesome texture and kept very well too. Mix 3 large eggs for a minute, until nicely fluffy, and a bit pale. Add 3 tbsp vegetable oil, ¼ c milk (I used almond milk but experiment with what works for you – rice, hemp for dairy free, buttermilk or milk if you are not avoiding dairies), 1 tbsp apple cider vinegar, and up to 1/8c maple syrup. I say up to because if you do not want to make the bread too sweet, dial that down. Separately, measure 1¾ c gluten-free flour, 1 tsp baking powder, ½ tsp baking soda, ½ tsp salt. Add the dry ingredients to the wet mixture. Then fold in the quinoa. Finally fold in some blueberries and some toasted almond slivers. Bake for 45 to 50’ at 375F until the crust is nice and golden brown. And then, cut yourself a slice warm (with butter, if you can :)), and let me know how it worked out for you! This bread is good with sweet toppings but could be eaten with savory things too, like some cheese if you can/are inclined to eat some. Using 3 eggs gives a slightly crumbly texture. Adding a 4th large egg will give the bread extra binding and perhaps a more chewy quality, depending on what you are looking for. The crust comes out quite crunchy because of the quinoa but will soften a bit over time. This bread is not very high (or deep) based on these quantities but if you want something higher, you can easily double quantities. This bread is quite versatile. You can replace the toasted almond slivers with poppy seeds too or some other nuts and flavorings. Or leave them out all together. And you can replace the blueberries with cranberries or other (not too wet) fruits too. I use my own GF mix which I have now been using for quite some time because it works for me but I think the recipe should welcome other mixes. You might need to tweak the wetness perhaps. This bread is low in FODMAP, gluten-free and dairy-free. It is also fairly wholesome, with a good amount of plant-based protein and fibers thanks to the quinoa.